I long had puzzled about Jacob Hufford (son of John, son of Christian b. 1716 Schwaigern). The facts on him just weren’t adding up. I found his marriage record to Elizabeth Ann ALLEN in Scott Co., Indiana, 25-June-1823. I found him in Scott Co. in 1830, living near his brothers Solomon, John, and William, and near Samuel HOPPER, his sister Elizabeth’s husband. He and his wife had four children under ten – two boys and two girls. In 1834, he bought 38 acres in Scott Co.; in 1837, another 38 acres; in 1839, 40 acres. All land was in section 1, township 3-N, range 7-E, 2nd PM meridian. In 1840, they were still in Scott Co. They were living next to Jacob’s brother William and a few farms down from Patsy Hufford, the wife of their brother John. Seven children in the household: five boys and two girls. In 1850, the family had moved to Decatur Co., Iowa. In the household were their children James, Jacob, Elizabeth, John, and Eliza. In 1860, John and Elizabeth were back in Scott Co., Indiana, with one grandson. By 1872, Jacob was in Cherokee, Butte Co., California, where he was listed on the voter registration list. In June 1880, his wife Elizabeth was in Butte Co., with their son James and daughter Elizabeth, but Jacob was not in the household. Aged 77 yrs. & 6 mo. Buried in the same cemetery are Jacob and Elizabeth’s son James Allen and John Newton. It is a clear match for Jacob’s wife Elizabeth. However, there are death notices for Jacob Hufford and his wife Elizabeth in the old weekly newspaper The Chronicle of Scott Co., Indiana. Elizabeth’s notice appeared Dec. 17, 1891, page 3, column 2, saying she died Dec. 9, 1891. Jacob’s notice appeared Dec. 24, 1891, page 3, column 2, saying that he died Dec. 18, 1891, in New Frankfort, Scott Co., Indiana. It just was not making sense. Did I have the wrong Jacob? Was there another Jacob in Scott Co., buried in the same small cemetery where Jacob’s brother William’s wife was buried? Then I found online a book of Scott Co., Indiana, will abstracts: “Index and Scott County, Indiana, Will Book Records,” by Carl R. Bogardus, 1974. “Present wife.” In other words, there had been another wife, another Elizabeth. Indiana Marriage Collection, 1800-1941, (found at ancestry.com) shows that Jacob Hufford married Elizabeth McFADDEN December 21, 1880, in Scott Co., Indiana. Two months after his wife died in California, Jacob married again in Indiana. But, he was 79. Why waste time? Further research showed that Elizabeth McFadden was born Elizabeth BRIDGEWATER in about 1816. She first married Henry SMITH; he died in 1849. She second married the widower Henry McFadden. 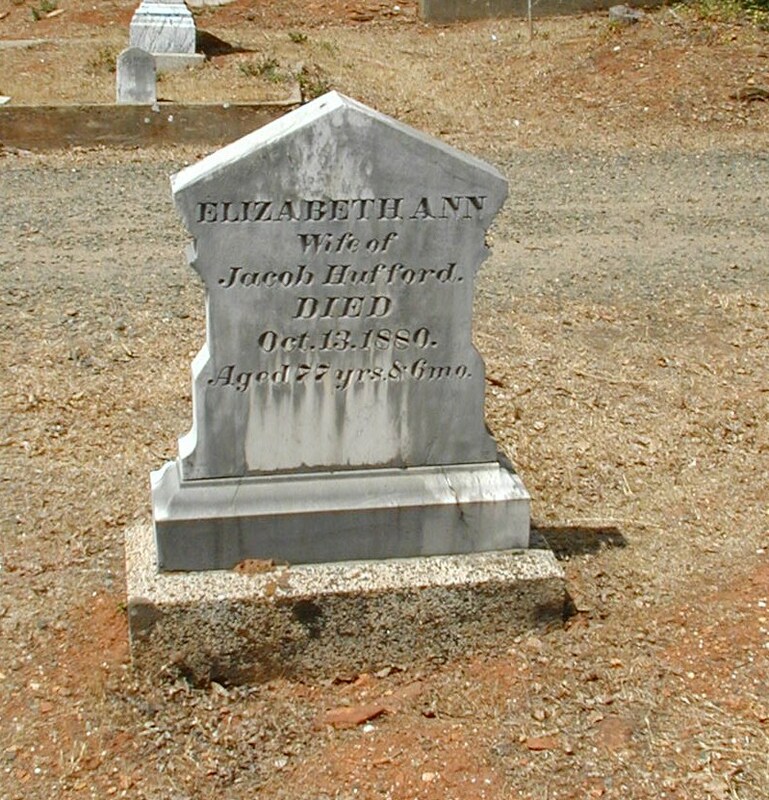 Jacob Hufford was her 3rd husband. All of Jacob’s children were born to his first wife, Elizabeth Allen. His children and descendants are on pages 264 and 265 of the 1909 HUFFORD FAMILY HISTORY. Below is his list of descendants extended. There may be some wrinkles still to be ironed out. 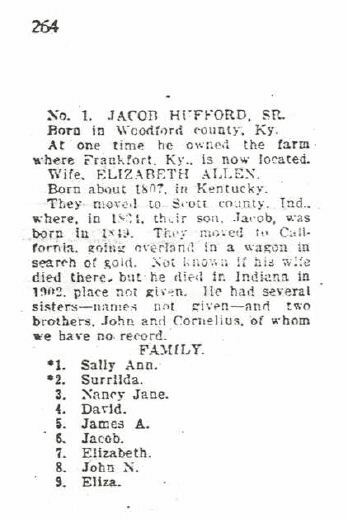 PAGE NOTE: Jacob Hufford is on page 264 of the 1909 HUFFORD FAMILY HISTORY. This entry was posted in Genealogy and tagged Christian > John > Jacob by bethesdaalice. Bookmark the permalink.